Using Implicit styles gives you the ability to easily extract and edit the default ControlTemplates of the controls. You can follow this article on how to extract the ControlTemplates. Border - represents the border and the background of RadTileList and is of type Border. 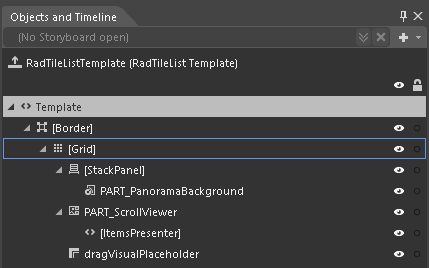 StackPanel - hosts the panorama background of RadTileList and is of type Border. PART_PanoramaBackground - represents the panorama background and is of type ContentControl. PART_ScrollViewer - represents the control that handles the tiles and is of type ScrollViewer. [ItemsPresenter] – generic container for tiles and is of type ItemsPresenter. dragVisualPlaceholder – represents the placeholder used in DragAndDrop operations and is of type ContentPresenter. [ContentPresenter] - displays the header of a tile group and is of type ContentPresenter. [ItemsPresenter] - generic container for grouped tiles and is of type ItemsPresenter. Border - represents the border and the background of a Tile and is of type Border. Grid – inner container that hosts the elements of the template and is of type Grid. oldContentPresenter - displays the content of a tile in order to simulate live tiles and is of type ContentPresenter. contentPresenter - displays the content of a tile and is of type ContentPresenter. MouseOverVisual - represents the border of the tile, when the mouse is over it, and is of type Border. SelectedVisual - represents the border of the tile, when it is selected, and is of type Border. 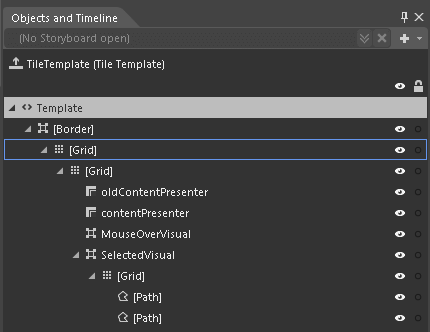 [Grid] - hosts the Paths for the indicator, when the tile is selected. It is of type Grid.